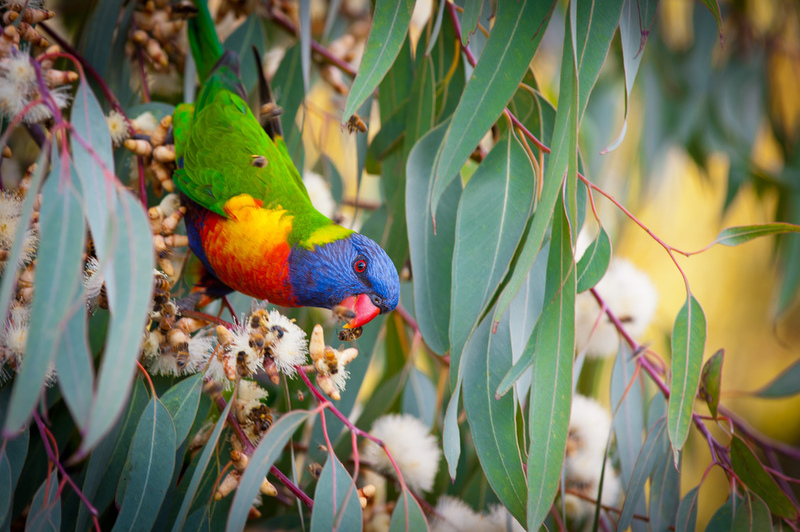 On a hot summers afternoon with the incessant humming of thousands of bee's collecting nectar from a nearby gum tree we would often sit over beer and wonder why the Rainbow Lorikeets (equally vocal in eating the flowers) would not be ravaged by the Bees. Whilst trying to capture a shot of the birds I noticed that they would land on a branch, waltz up to a section teaming with flowers and reach town and remove a Bee. I assumed they would kill the Bee and yet after what appeared to be a bite of some kind the Bee did not drop to the ground dead or wounded but would fly around in a lazy circle and land back on another part of the tree unbothered. What initially seemed as a bite actually looked (through the camera lens) like a tender and precise clasp of their leg and quick but gentle flick of the beak to remove the bee but not hurt it. It would happen in a blink of an eye. Once discovered it was soon obvious that all the Rainbow Lorikeets were doing this. In this shot you can see the beak around the bee's back leg. If you sit for long enough the sun will set and almost as one the Bees and Birds will all leave the tree within one or two minutes. Going from a constant humdrum noise of activity, enough to drown out a passing car, to absolute silent save only the wind through grass, trees and the sound of an aluminium can being opened with equal bird like precision.